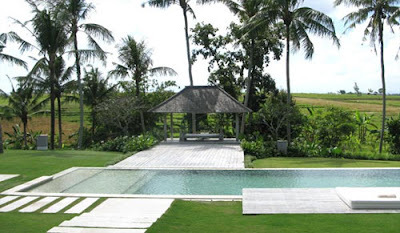 Standing in a Pererenan area which is bordered by verdant rice field and the river, Infinity Bali Private Villa is walking distance to Canggu Beach- the famous surfing beach. Despite located in the tranquil area offering the unobstructed view of amazing rice terrace and mountain, this luxurious Bali villa is only 15 minutes far away from the gorgeous Seminyak and 5-minute drive to reach one of top ten golf course in the world, Bali Nirwana Golf Course. Somehow, people need a time to unwind from the tiring routine and Infinity exclusive villa seems the blissful retreat. Occupying 6100 meter-square land, this villa will also grant the dream of romantic tryst. This exquisite Bali villa has to be-serving the high-class facilities and service just like Infinity Villa does. Villa infinity provides dining room accommodating more than 12 people which has a bridge to the kitchen, living room with giant red lounge facing the 40x7 meter private swimming pool, media room housing cinema, lounge, pool table and games, Balinese typical Bale which can be set as wedding altar, and of course modern kitchen with two professional cooks.